Computer models for determining key boundaries are important tools for computer analysis of music, computational modeling of music cognition, content-based categorization and retrieval of music information and automatic generating of expressive performance. 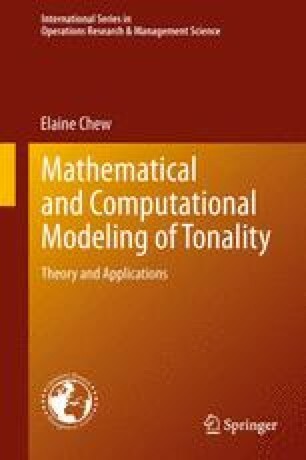 This chapter describes a Boundary Search Algorithm (BSA) for determining points of modulation in a piece of music using a geometric model for tonality called the Spiral Array. For a given number of key changes, the computational complexity of the algorithm is polynomial in the number of pitch events. We present and discuss computational results for two selections from J.S. Bach’s A Little Notebook for Anna Magdalena. Comparisons between the choices of an expert listener and the algorithm indicates that in human cognition, a dynamic interplay exists between memory and present knowledge, thus maximizing the opportunity for the information to coalesce into meaningful patterns. I thank Jeanne Bamberger for her guidance and cogent advice that made this research possible; and Martin Brody for his insightful comments on interpreting the results in an early version of this document.